Well, we're back from Madison and back from our first time eating at a Texas Roadhouse. I honestly didn't know what to expect when we got there but, overall, I have to say I was happy with my visit. We got there a little after the lunch rush and were seated right away. Our service was outstanding throughout and I even got a drink re-fill (something that, surprisingly, rarely happens when we dine out). We didn't have to wait too long for our food and, the best part, I didn't have to order or pay for my food using one of those annoying tabletop kiosks, as seems to be the case with a growing number of restaurants lately (I really hate those things. If I wanted to have a machine take my order/payment, I would just order a pizza online and have it delivered). As far as food goes, I had no complaints. 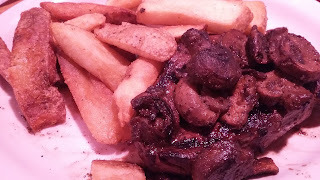 The sirloin steak I ordered was very tender and cooked just the way I liked it. The steak fries, while a little salty, were crisp and had a decent taste to them and I especially loved the cup of chili I ordered to go with it, both to eat and dip my fries in. We also ordered fried potato skins as an appetizer and three of us (our youngest daughter didn't want to try them) were big fans. The price of the food was pretty much what I was expecting it to be. It wasn't the most affordable restaurant we've eaten at but the prices on the steak, etc. were comparable to many other eating establishments and nothing was priced obscenely high. I was able to feed all four of us (including appetizer and drinks) for less than $60 total. My only real dislike about our lunch experience was the size of the table. It would have been fine if it were just two of us. But, it was very cramped for the four of us, especially since there were a couple peanut buckets and a menu holder taking up some of the space. We had a heck of a time fitting our various plates, glasses and bowls and, if there is one thing I would change about the restaurant, it would definitely be that.